Missing logos on the headrests... something on the horizon perhaps? (01/03/2019, 16:39)omnicity4659 Wrote: Missing logos on the headrests... something on the horizon perhaps? I hope not. The full screen text is much easier to read. Although I still think they should have them like MTA buses in NYC, where the destination is full size, but every 1.5(?) seconds it changes to either 'via [wherever]', or 'LIMITED' (express), or even just more detail on the exact destination. So for GNE buses with the older non-self-updating destination controllers could flick between a full screen 'NEWCASTLE' & 'NEW BRIDGE ST' for example. Or for buses with self-updating destination controllers like the refurbished Cobalts, from the Coast they could flick between 'NEWCASTLE' (full size) & 'via Whitley Bay & Cobalt' (over 2 lines) - then once they pass Cobalt just flick between a full screen 'NEWCASTLE' & 'HAYMARKET'. According to the Go North East fleet news, only 5243, 5246, 5254, 5258, 5259 and 5260 are left to be repainted in to Go North East livery from Whey Aye Five-0. 6101 took around a month to refurbish, so hopefully the next one is due back soon, wonder if it'll be like the Citaro's and 2 a week will arrive back from next week? (01/03/2019, 21:17)Michael Wrote: According to the Go North East fleet news, only 5243, 5246, 5254, 5258, 5259 and 5260 are left to be repainted in to Go North East livery from Whey Aye Five-0. That was only when we were in the swing of things - there's fewer buses this time as they're not 'surplus' in the fleet so to speak (the Durham Diamond Citaros could be released altogether as they'd been replaced by new vehicles - these B9s haven't). So at any point there should only ever be three B9s away for refurbishment. 6102 has returned today, with 6105 going away. 6103 will return next week. I'd estimate completion of these refurbishments by the middle to end of summer, based on this, although depending on what other work Bus & Coach World have on, they could be done sooner. (02/03/2019, 11:56)Dan Wrote: That was only when we were in the swing of things - there's fewer buses this time as they're not 'surplus' in the fleet so to speak (the Durham Diamond Citaros could be released altogether as they'd been replaced by new vehicles - these B9s haven't). So at any point there should only ever be three B9s away for refurbishment. Thanks, are you able to confirm if the Fab 56 B9's will go for refurb after? Here is an interesting question. If a non standard spare vehicle type is required for the Cobalt Clipper come the 24th March (or when all refurbs have been completed), will the 309 be the priority route for the correct allocation with the 310 getting the spare vehicle allocated? This being a massive grill down the side. Photo didn't post and it's impossible to edit on my phone. 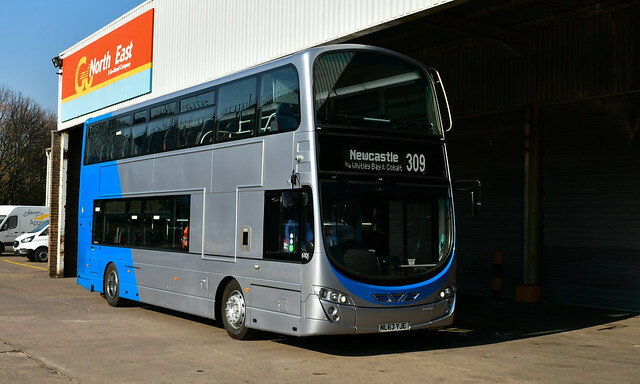 I didn't notice any rattles whatsoever when I had a ride on it from Gateshead to Hebburn the other day, if anything I would say it was way better than a Streetlite and only just better than an E200MMC in terms of ride quality was very smooth.